In my years working with my clients designing dog friendly yards, I’ve come up with many strategies to prevent my client’s dogs from bringing the outside in. In the summer it might be a stick which you can easily throw, and in the fall; it’s a few leaves. But here in Portland, Oregon, winter and spring means mud. And mud is not so easy to stop at the door. So is it even possible to have a mud free dog in Portland, Oregon? The solution starts with your experienced dog friendly landscape designer. 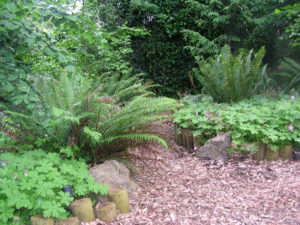 The changes we made to the landscape for Jackie and Kurt in Tigard have saved hours of grooming and large dog bathing. Their Newfoundlands are now clean and free of mud and can come in to the family room and hang out with their humans. This was a side benefit of their Landscape Design in a Day. Their old house comes with huge magnificent old Douglas Fir trees and lots of shade. Where there was shade, there was mud. Prior to installing our landscape design, the dogs could not come into the house at all because they were extremely muddy. I was hired to design a new entry and garden for the front yard and to provide garden coaching for the backyard. No one was talking about having mud free dogs. They could not imagine it enough to ask for it. It’s my job to solve landscape problems for the entire family. 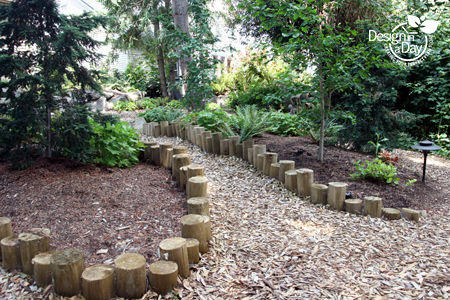 Kurt and Jackie used my special cedar chips to create a mud free woodland “floor” in their Douglas Fir Forest. It’s beautiful even now, ten years later, the dogs are clean and poop is easy to scoop even in the winter. 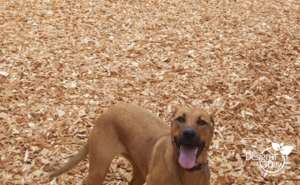 Elana and her brother play in a cedar chip yard just for them and are mud free. Cedar chips also worked well for another client with two large dogs, Rhodesian ridge backs. We created an enclosed area with plenty of room to rough house, so they were very happy in their new play yard. They didn’t track mud in the house (which made their guardian and my client happy) and other spaces around the property now have a far more aesthetically pleasing garden design. 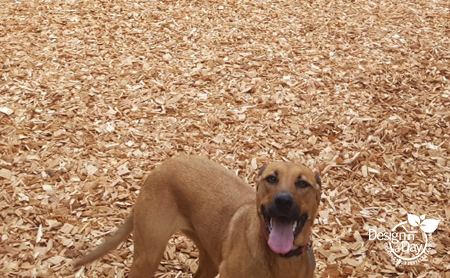 Heads up: If you have 2 large dogs who love to wrestle and chase, the cedar chips will eventually hill up in some areas and you will need to rake it out to keep a flat play space for the pups. The short wood edging provided enough to keep two standard poodles down the right path. Yet another family had full sized standard poodles. Poodles are smart and they have a lot of energy. Many times, dogs (and the landscape plants) benefit from having clear paths installed to circle around and around and around. It’s a lovely way to play chase and get lots of exercise without the hard impact on their hips and backs that concrete or pavers do. A simple 12 inch raised bed can often be enough to point the pups in the right direction and build their running patterns. Once the plants fill in, most pups will stay on the paths and keep their feet mud free. 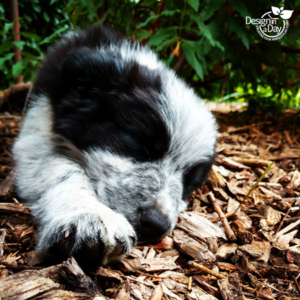 In this scenario, you may need to protect your plants for the first growing season with a temporary barrier like a short wire fence or use plants that are either tough enough to handle tromping or can slightly repel the dogs because of smell. Plant Tip: Hardy Geranium leaves (Geranium macrorrhizzum) smells like cedar if bruised. Dogs will play near by happily but don’t walk or lie in it because of the smell. I would never use plants with an odor that would hurt or cause discomfort to a dogs sensitive nose. 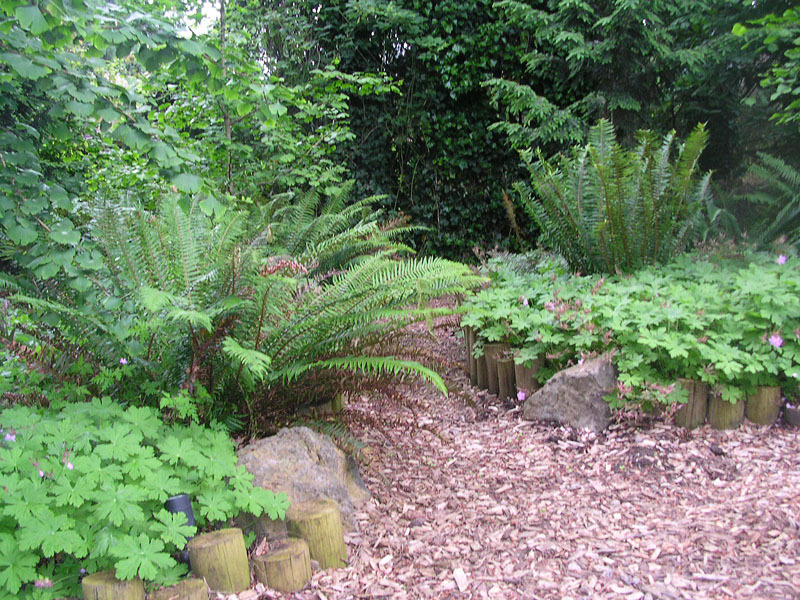 Sword fern and hardy geranium in a raised bed work well for a dog friendly planting. Creating landscape designs for dogs and their guardians is a joy and one of the perks of my profession. 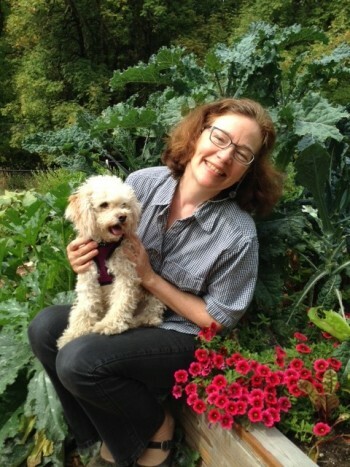 Read more ‘Protecting Your Yard from Your Pet and Your Pet from Your Yard’ on Houzz for an interview with your dog friendly landscape designer Carol Lindsay written by Gwendolyn Purdom. And make an appointment for your own dog friendly landscaping! This is my favorite event of the year. 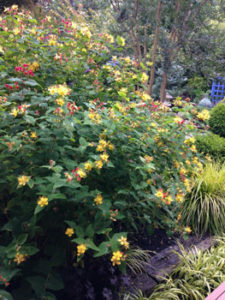 It’s not a typical garden tour where the focus is only on attractive plant material. Each landscape from the paths to patios, plant vignettes with art, unique edible gardens, rain gardens was planned. Expect to see unique use of space, dramatic layouts, small landscapes with surprisingly useful spaces, privacy screens and plantings, recycled materials used in new ways and much more. Fusions of modern landscape design, cottage garden and NW natural landscapes will be seen, admired, and shamelessly copied. Each year garden artists compete to have their art installed in the gardens for the tour. Some art will be available to purchase. Take some great photos!! A vignette with the balance of color and proportion has been created for your viewing pleasure. Love plants? You will see plants that are new to you or see familiar plants used in new and fun ways. There is a lot of opportunity for copying great ideas or simply appreciating landscapes that are so well integrated. The tickets are $25.00 and the profits support educational programs for landscape design students at local colleges. If you like getting a discount for early ticket purchase, here is a link. Typically discount tickets are available until May 1st. So hurry and get your discount and have your tickets mailed to your door. This years gardens are on Portland’s Westside and are open by the generosity of the homeowners. Each garden will have the designers standing by to answer any of your questions. 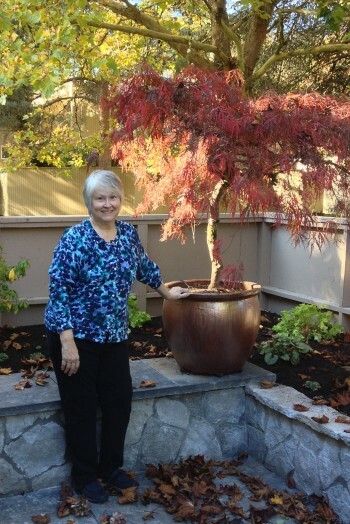 Carol Lindsay loves to create unique, practical and affordable landscape designs using her collaborative Landscape Design in a Day process. Step 1: Using the Design in a Day kit, you answer a few questions and measure your site, saving time and money. Step 2: Your designer looks over your work and studies your landscape drawing and photos. Step 3: Your designer then interviews you over the phone, using email to further prepare for the design day. Step 4: Together, you and the designer create a design tailored to your needs. Usually the design is created at your kitchen table. At the end of the design day, you have your design and can start working on your dream landscape right away. And you helped make it possible. 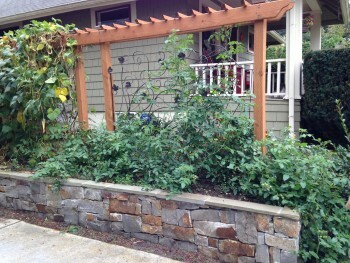 Landscape Design in a Days are typically $1495, occasionally $1895. This includes the base drawing kit, flow design, hardscape plan and planting plan for the front or the back of a smaller property. Most of my clients will install or have the new landscape installed in phases so designing just a front or back works well. When I created Landscape Design In A Day, LDIAD, I expected to be working with people who wanted to keep it all hands-on. It turns out only about 50% of my clients are DIYers. DIYers like LDIAD because they are ready to roll up their sleeves and do the prep for their design process. They save money and become more aware of their properties possibilities and they fine tune their wish list by completing the LDIAD kit. Best of all the design is finished at the end of the day to they are ready to get started. New Portlander Loves Colorful Garden. Not a DIYer? This process works for clients who want a collaborative design process, want to save time and money but want the new landscape installed by professionals. These clients typically do their measuring and pre-design work but once the design is completed, they hire one of my fully vetted and talented landscape professionals to handle the installation. Don’t want to measure and draw your base map? A few clients hire us to do this step as well. That is an option. The price for preparing the base map ranges from $300 – $700 for a typical LDIAD property. LDIAD will provide a to scale landscape design drawing with hardscape materials and plantings. A plant list with plant name, quantity and size to purchase is included. Experienced gardener hires landscape designer. First we focus on creating the perfect property flow and layout. Clients and designer work together and finalize the preferred layout. Next we focus on creating a planting plan. Once you have your design you can DIY, use my referred professionals or some other professional that you prefer. That is a benefit to using an independent designer rather than a designer who works solely for an installation company where you are stuck in house only. I’m always available to consult, or refer you to services you need if I don’t have the answer myself. Post design services are flexible: Some clients hire me to handle all the details, some work completely on their own and some bring me in to guide plant placement and coach them on planting techniques so they can be more successful as DIY. For more information or to schedule an appointment contact me at 503-223-2426 or email me at carol@design-in-a-day.com. Please include your address. I’ll look up your property and be better able to tell you about costs and the benefits of my design service. My clients had a large property that had been a historic dairy. They already had the fabulous old craftsman house that they had lovingly restored. I was hired to create a landscape design. They needed a detached garage for cars, extra parking and a studio for Hudson’s photography business. They had a design for the studio/garage and thought they had the perfect placement. I quickly realized the placement of the garage was all wrong as it would have the patio, outdoor dining and entertaining area looking directly at parked cars when they had guests. After establishing my credibility, I told them I could make it so much better and that we needed to think about the property as a whole in order to place the garage to its best advantage. They were surprised and then grateful. As we got into the design process, we discovered the right location for the garage meant changes to their original garage design. It was the right thing to do. New location of the garage/studio. No matter how much I love plants, landscape and garden design, design is all about how you move through the property…. and that includes cars. When I’m having dinner with my friends outside, I don’t want to look at parked cars. They had a large property but we needed clever use of the usable space. My design: I turned the garage so that while on the back porch of the grand old house or down in the woodland patio, what we saw was the inviting studio entrance complete with its own small porch and softening summer interest plantings. We did not see the garage doors. The garage was turned so the cars would enter on the 45° angle. This also created more room for lawn and plantings on their property. I used screening plants to hide guest’s parked cars. Driving into the property we saw the attractive facade of the garage with overhead arbor. Because the garage is angled, the doors are not the most powerful visual you see as you drive up. This greatly enhances curb appeal. When they were working with their architect, they didn’t know the questions to ask that might have led them to the same placement I selected. While they thought they were hiring me just to create the garden, they were very pleased that I took on the task of designing for the whole property. We created wonderful plantings for the new woodland patio garden and foundation plantings for both the house and the garage. This is one of my happiest designs because I was able to make the property work so much better. This is what the property looked like the day I arrived for our first design appointment. It’s easy to organize getting inspired and waking up your inner greenie by going to the spring home and garden shows. There are many summer garden tours but only one where every garden is professionally designed. The biggest show in Seattle is the Northwest Flower and Garden Show. Some of my clients and my garden obsessed sister will be getting hotel rooms and making a weekend out of it as they do every year. It’s hard to say what is the best feature of this show but for me it is the highly entertaining and informative seminars and hands on demonstrations. Our green world has its share of rock stars and some of them are hilarious and in their best form. It’s basically stand up comedy with a screen backdrop of fabulous “over the top” gardens and lush plants. And yes you can learn a lot as well if you are interested in gardening no matter your level of experience. Show Garden uses recycled wood as part of the hardscape brilliantly. Back home in Portland, I won’t be setting up my own booth this year. Come and see me at the Portland Home and Garden Show, February 19th through the 22nd. I will be in The Showcase Gardens in the ANLD display garden. Last year out moonlight garden won first prize. In addition to the usual dizzying array of trades folk, artists, and plant vendors, this show has the display garden competition which is my favorite. 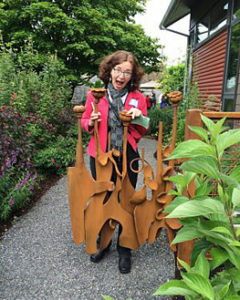 I will be at the Yard, Garden and Patio show representing the Association of NW Landscape Designers. I’d be delighted to meet you. 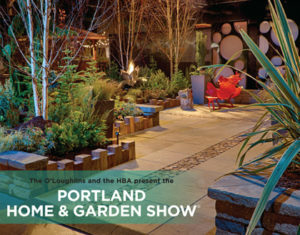 Portland Yard Garden and Patio Show- February 27th through March 1st. 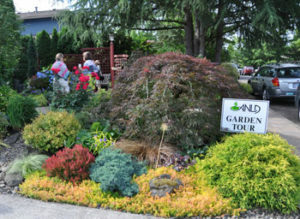 This year the Association of NW Landscape Designers will have their famous Designers Garden Tour tickets at the YGP show available for discounted early purchase. If you (like many of my clients) tend to go to this garden tour every year anyway, come on down to the show and get your garden tour tickets at the early bird price. The tour is June 20, 2015. It has become one of the hot west coast garden tours and typically sells out, so taking advantage of early bird discounts saves you money and ensures you will have a ticket. Here is a link to photos of the 2014 ANLD Designers Garden tour which was our Silver Jubilee year. It’s never to early to start planning and it’s always disappointing when time gets away with me and I miss attending at least one of the shows.